The Overture sideboard offers a fresh breath of air for your dining room. Light and easy colors are combined with a flash of crystal accents to give this buffet that easy dazzle most only dream of. This serving cabinet features door pulls with crystal accents, a row of crystals beneath the top, and polished clear crystal acrylic front legs. Give your dining room a simple sizzle with this tastefully bedazzled sideboard. 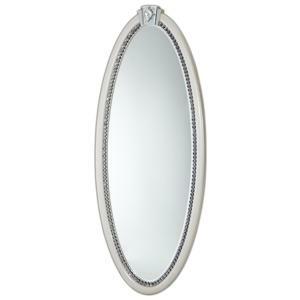 This dresser oval mirror makes a grand statement used at the top of the coordinating dresser. It has crystal accents and chrome trim for glamorous appeal. The cut crystal overlay at the top center of the mirror frame add to its rich look. 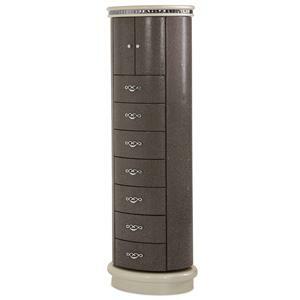 Highly stylized, this two-door chest offers generous storage with unique features for your master bedroom. Light and easy colors are combined with a flash of crystal accents. The chest features pulls with crystal accents, a row of crystals beneath the top, and polished clear crystal acrylic front legs. It presents an oval shape with its curved front. Inside the two center doors are three spacious shelves. Two side doors offer ideal for jewelry storage with hooks inside one door, and small shelves inside the other door. 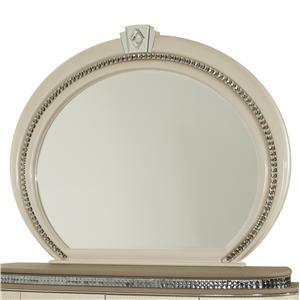 Topped with a facted accent crest and trimmed with decorative crystals, this oval mirror adds grandeur to your master bedroom, dressing room, or other living space. As versatile as it is lovely, the mirror opens to reveal jewelry storage inside. 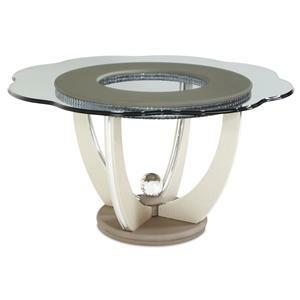 Decorative crystal accents and a uniquely shaped glass top give this table a dazzling look. Designed to make a statement in your dining area, it features polished metal strips accenting its pedestal base. The textured finish with subtle two-tone complete the table's divine style. 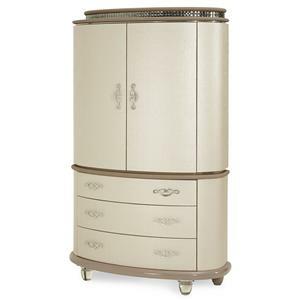 Part lingerie chest, part jewelry armoire, this unique storage piece enhances your master bedroom or dressing room with its exquisite storage and luxurious style. 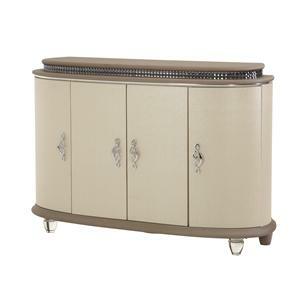 It features an oval shaped with two doors and six drawers at the front of the unit. Two curved doors on each side open to allow access to eight small shelves and jewelry hooks. Swivel the chest to the back side to make use of the full-length mirror. Upholstered in a shimmering Sequin brown, the bases in a lighter tone create a two-tone design. 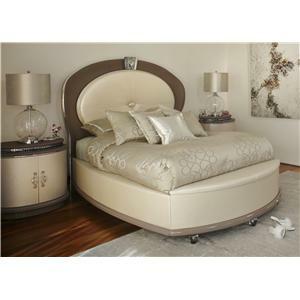 Indulge your senses with this upholstered bed. 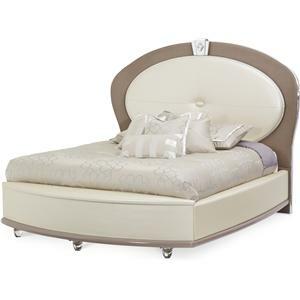 Featuring leatherette upholstery in a creamy pearl color and brown tone, the bed has a uniquely shaped oval headboard with center tuft, curved slightly curved side rails, and curved storage footboard. 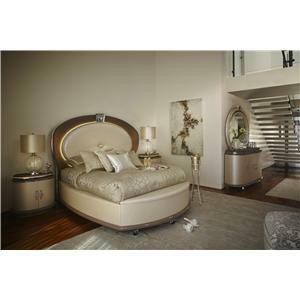 The headboard showcases polished chrome accents and a cut crystal overlay at the top center. The headboard has LED light surrounding the center panel for ambience.